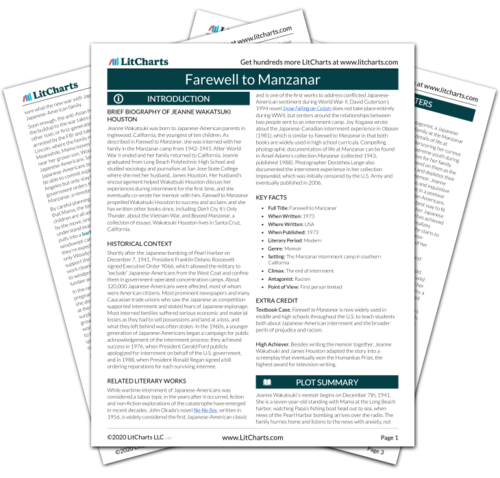 Instant downloads of all 942 LitChart PDFs (including Farewell to Manzanar). Welcome to the LitCharts study guide on Jeanne Wakatsuki Houston's Farewell to Manzanar. Created by the original team behind SparkNotes, LitCharts are the world's best literature guides. A concise biography of Jeanne Wakatsuki Houston plus historical and literary context for Farewell to Manzanar. A quick-reference summary: Farewell to Manzanar on a single page. In-depth summary and analysis of every Chapter of Farewell to Manzanar. Visual theme-tracking, too. Explanations, analysis, and visualizations of Farewell to Manzanar's themes. Farewell to Manzanar's important quotes, sortable by theme, character, or Chapter. Description, analysis, and timelines for Farewell to Manzanar's characters. Description, analysis, and timelines for Farewell to Manzanar's terms. Explanations of Farewell to Manzanar's symbols, and tracking of where they appear. An interactive data visualization of Farewell to Manzanar's plot and themes. Jeanne Wakatsuki was born to Japanese-American parents in Inglewood, California, the youngest of ten children. As described in Farewell to Manzanar, she was interned with her family in the Manzanar camp from 1942-1945. After World War II ended and her family returned to California, Jeanne graduated from Long Beach Polytechnic High School and studied sociology and journalism at San Jose State College where she met her husband, James Houston. Her husband’s encouragement helped Wakatsuki Houston discuss her experiences during internment for the first time, and she eventually co-wrote her memoir with him. Farewell to Manzanar propelled Wakatsuki Houston to success and acclaim, and she has written other books since, including Don’t Cry, It’s Only Thunder, about the Vietnam War, and Beyond Manzanar, a collection of essays. Wakatsuki Houston lives in Santa Cruz, California. 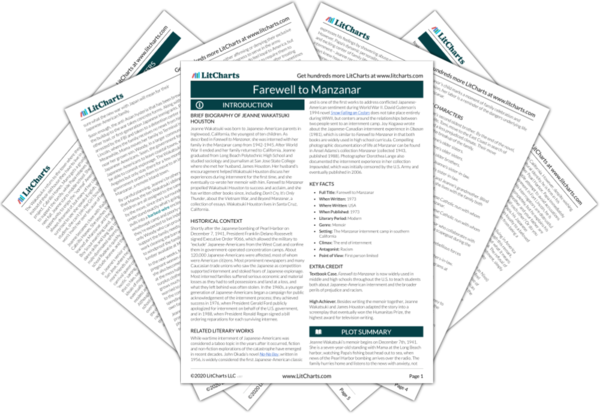 Get the entire Farewell to Manzanar LitChart as a printable PDF. Shortly after the Japanese bombing of Pearl Harbor on December 7, 1941, President Franklin Delano Roosevelt signed Executive Order 9066, which allowed the military to “exclude” Japanese-Americans from the West Coat and confine them in government-operated concentration camps. About 120,000 Japanese-Americans were affected, most of whom were American citizens. Most prominent newspapers and many Caucasian trade unions who saw the Japanese as competition supported internment and stoked fears of Japanese espionage. Most interned families suffered serious economic and material losses as they had to sell possessions and land at a loss, and what they left behind was often stolen. In the 1960s, a younger generation of Japanese-Americans began a campaign for public acknowledgement of the internment process; they achieved success in 1976, when President Gerald Ford publicly apologized for internment on behalf of the U.S. government, and in 1988, when President Ronald Regan signed a bill ordering reparations for each surviving internee. While wartime internment of Japanese-Americans was considered a taboo topic in the years after it occurred, fiction and non-fiction explorations of the catastrophe have emerged in recent decades. John Okada’s novel No-No Boy, written in 1956, is widely considered the first Japanese-American classic and is one of the first works to address conflicted Japanese-American sentiment during World War II. David Guterson’s 1994 novel Snow Falling on Cedars does not take place entirely during WWII, but centers around the relationships between two people sent to an internment camp. Joy Kogawa wrote about the Japanese-Canadian internment experience in Obasan (1981), which is similar to Farewell to Manzanar in that both books are widely used in high school curricula. Compelling photographic documentation of life at Manzanar can be found in Ansel Adams’s collection Manzanar (collected 1943, published 1988). Photographer Dorothea Lange also documented the internment experience in her collection Impounded, which was initially censored by the U.S. Army and eventually published in 2006. Textbook Case. Farewell to Manzanar is now widely used in middle and high schools throughout the U.S. to teach students both about Japanese-American internment and the broader perils of prejudice and racism. High Achiever. Besides writing the memoir together, Jeanne Wakatsuki and James Houston adapted the story into a screenplay that eventually won the Humanitas Prize, the highest award for television writing. Connelly, Irene. "Farewell to Manzanar." LitCharts. LitCharts LLC, 6 Dec 2018. Web. 20 Apr 2019. Connelly, Irene. "Farewell to Manzanar." LitCharts LLC, December 6, 2018. Retrieved April 20, 2019. https://www.litcharts.com/lit/farewell-to-manzanar.